ASUS’s Transformer Prime is one of the most hotly-discussed Android tablets out there. Much of the hype is due to its best-in-class quad-core Tegra 3 chip which offer desktop-class processing and graphics with excellent power management. ASUS recently released a bootloader-unlocker tool for the device and, with that, the Android development community for the device has sprung alive. ClockworkMod Recovery was recently released for the device, and today we came across an excellent all-in-one tool that allows users to root, install Busybox and Superuser, flash ClockworkMod Recovery and unroot not just the ASUS Transformer Prime TF201 but also the Transformer TF101 on both Honeycomb and Ice Cream Sandwich on the latest as well as next-to-latest ASUS firmware. Check it out after the jump. Introducing viperMOD PrimeTime! 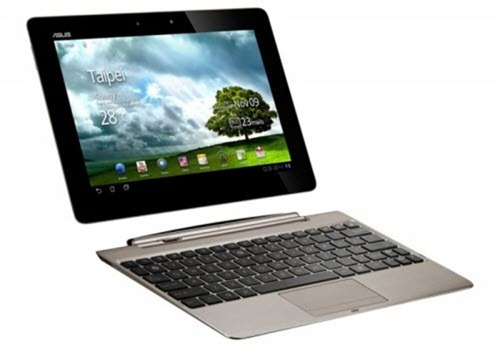 An automated rooting program for your Asus Transformer Prime TF201 (ICS or HC supported) and the Asus Transformer TF101. It is very simple and easy to use with extra features that other root methods don’t have. Unlike other all-in-one tools, this one doesn’t work right out-of-the-box. It requires a little setup before you can start rooting/unrooting but it’s nothing complicated, especially if you follow the step by step guide below. Step 1: Unlock the bootloader on your Transformer Prime using ASUS’s official tool [link]. Step 2: Download viperMOD PrimeTime v4.5.zip for Windows [Official Thread]. We haven’t linked directly to the .zip file as it may be updated to a newer version after this guide has been published. Step 3: Extract the contents of the .zip file using a suitable software. We recommend 7-zip. Step 4: If you haven’t already set up ADB, install the drivers included in the Drivers folder inside extracted .zip folder. Step 5: Be sure to stop ASUS Sync and Splashtop from running. This is apparently very important. Step 6: From your Transformer Prime, enable USB Debugging from Settings > Applications > Development. Step 7: Connect your Transformer Prime to your PC. Ensure that no other Android devices are connected. 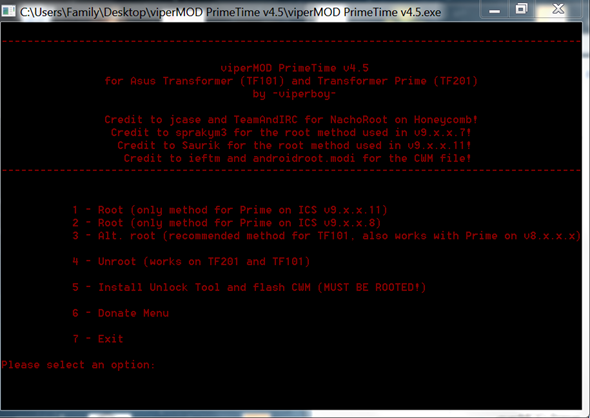 Step 8: Launch viperMOD PrimeTime.exe and choose your option. You can choose to root your device and then install Busybox as well as flash ClockworkMod Recovery. Step 9: After rooting, install OTA Root Keeper [Market Link]. For queries, check out the official thread over on XDA-Developers.